For my cousin James's birthday, we usually have a small get together of the Dexter Dinner crowd. The hallmark of this get together is James's annual game of "Stump the Cooks" where he challenges Auntie Miranda and I on his choice of meal. So far we have ALWAYS risen to the challenge, I'm proud to say! This year he challenged me to a dinner menu of "European peasant food" and since our family is primarily Scandinavian, that's the direction I went. His challenge to Auntie was "cherry and vanilla checkerboard". Yup, nailed it on both! Today, I present Swedish Meatballs (not made with the cream of mushroom soup man of us grew up on) with cranberry sauce. Later this week I'll have recipes for Jannsson's Temptation, Cucumber Salad, and Auntie's Cherry and Vanilla Checkerboard Cake. 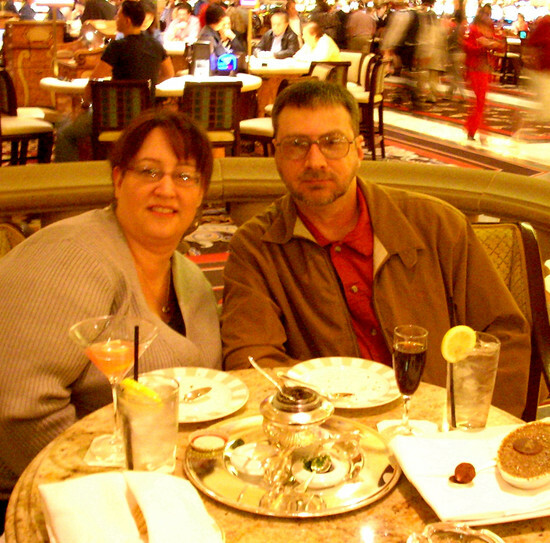 Gene and I first had caviar at the Petrossian piano/martini bar inside the Bellagio hotel in Las Vegas. We'd walked by the little bistro several times and one day we just decided to stop in for a drink and a nosh. Neither of us had ever eaten caviar before so we decided to splurge and give this new-to-us delicacy a try. Delicious! I think it was one of the first times we've ever tried something we didn't know how to eat that we simply asked the waitress to tell us what to do. That seems like a simple concept but it. was a learning experience for us in several ways. I don't know why I thought the waitress might be snooty, my own insecurity, I guess. As Auntie Miranda said, only a stupid server wouldn't make sure a patron had a great experience with new food or they'd be burning their own tip money up. Since then we've been very loyal to Petrossian and splurge on caviar and fois gras every other New Year's Eve or so. We've been building up quite the tradition: a good pasta, home-made bread, and a fresh salad, followed by poker or other family games, and a midnight caviar, a good bottle of champagne, and/or dessert buffet with Auntie Miranda, James and Lynn, and Corbin and Jenn. The Petrossian caviar is overnighted from New York inside cold packs. To serve, all you have to do is open the tin it comes in, place over crushed ice in a secondary bowl to keep it chilled, and dip it with a non-metallic (to avoid the metal giving the caviar a weird taste) spoon. Ours happens to be mother of pearl, ordered from Petrossian our first year. Caviar can be served on soft (our preference) or toasted baguette or regular bread toast points, blinis, or crackers of any kind. Toppings are a personal choice but common sides are chopped hard-boiled egg, sweet gherkins, dill gherkins, capers, minced red onion, scallions, or chives, kalamata olives, and creme fraiche--a type of sour cream with a higher fat content and less acidity. We served this little mini buffet on a lazy Susan to keep us, lazy celebrators that we are, from having to pass everything around a million times. I made home-made baguette and bought two kinds of crackers: one light and crispy and the other more toothy and whole-grained. Along with the caviar, we also ordered a duck fois gras pate and a pheasant, fig, and cognac pate. Everybody tried many different combinations of toppings with the caviar but it seemed like the favorites were either simply the caviar on a thin slice of baguette or any of the breads topped with caviar, creme fraiche, capers, and chopped sweet gherkins. There is something about that combination that meets the magic taste combination of salty, sour, sweet, and savory. Mmmm... I'm already looking forward to next year even though this year has barely begun. New Year's Day: Get your Black-Eyed Peas on!